The Hitbot Z-Arm brings incredible versatility and convenience to hobbyists, makers and manufacturers. 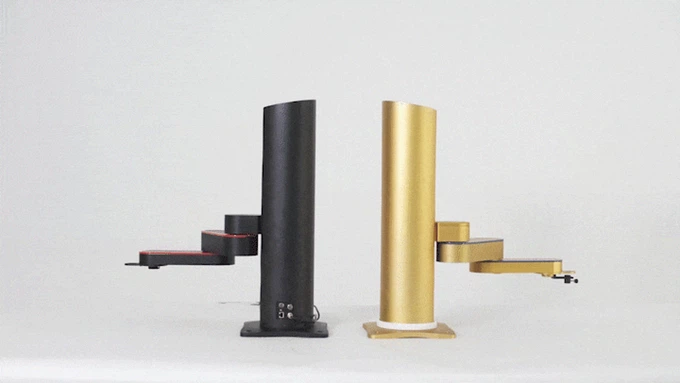 This one of a kind robotic arm can perform any number of tasks including 3D printing, soldering, engraving and assembly guided by a unique and intuitive set of programming tools that anyone can use. Never before has the convenience and versatility of a SCARA (Selective Compliance Articulated Robot Arm) been so accessible and user friendly. This type of advanced robotic arm uses a parallel axis joint layout which articulates in a similar way to a human arm, making it faster and more accurate than mechanical arms of previous generations. These incredible robotic arms have been used in the most advanced manufacturing facilities for sorting, circuit building and even automobile assembly. Now, with the release of the Hitbot Z-Arm, this powerful technology is available to hobbyists, makers, inventors and robotics enthusiasts. This programmable robotic arm can be anything from a personal assistant to a useful tool or dependable production line component. The Z-Arm will change the way people use technology and provide a completely new type of easily programmable robotic tool. Unlike the complex and expensive industrial robotic arms that inspired it, the Z-Arm is extremely easy to program for virtually any task. No special programming knowledge is necessary, making it simple for anyone to use. It uses an integrated driver and motion controller that can be programmed with an intuitive App using a simple graphical interface. It can even be manually programmed by moving the arm itself to create repeatable motions for different tasks. 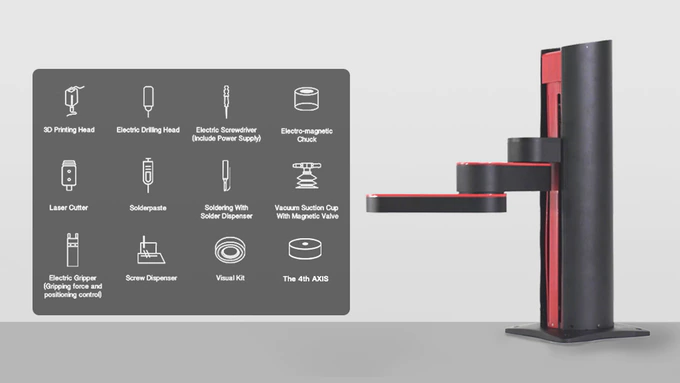 The list of applications that can be applied to the Z-Arm is endless. It can perform 3D printing, laser engraving, circuit board soldering and assembly. It can play games, write, cut, perform repetitious actions or simply help out around the house as a personal assistant. It is even equipped with a camera for accurate visual identification, perfect for sorting and organizing. It handles objects of all types, even carefully gripping fragile items with ease. For more complex processes, multiple Z-Arms can be programmed to work together. Z-Arm can also work alongside humans with its safety-rated monitored stop, which stops the robot if a human enters its collaborative workspace. As a programmable robotic arm with high precision, its uses are only limited by the imagination. In terms of specifications the Z-Arm has an impressive list including 0.02mm Repeatability, a 400 mm Reach, and a front arm Rotation of 360 degrees. Add to that, a 430°/s Speed and a Payload capacity of up to 2kg which allows it to deliver industrial grade performance in a cost-effective manner. It is simply one of the most versatile robotic arms available today. The team behind Hitbot are designers, developers and robotics experts who have years of experience in the field and a passion for creating powerful robotics for consumers. Their unique products are designed to make robotics easy for anyone to program and use. The Hitbot Z-Arm is being launched via Kickstarter campaign so the company can reward their community of early adopters with special deals and pricing. Dieser Eintrag wurde veröffentlicht in 3D Printing, Crowdfunding, English, General, Hardware und verschlagwortet mit 3D-Printing, CNC, Gripper, Hitbot, Laser Engraving, Manipulation, Z-Arm von Sebastian Trella. Permanenter Link zum Eintrag.